Blake Bauer has recently joined the staff of Mason Funeral Home. The O’Neill, Neb., native started working in Winner on Feb. 5. Through a mutual friend Bauer learned there was an opening in Winner. He came here for an interview in October. “I was hooked from the beginning,” he said. Prior to moving to Winner, Bauer worked for a year at Home for Funerals in Norfolk, Neb. In 2011, Bauer graduated from O’Neill High School. He then went to Wayne State University on a golf scholarship. After two years at Wayne State, Bauer went to North East Community College in Norfolk and majored in nursing. Both of his parents are nurses and he felt he would give this career a shot. But after a year, Bauer decided nursing was not for him. He went back to O’Neill for the summer and his dad asked Blake if he has ever considered being a funeral director. The family knew the funeral director in O’Neill and Blake shadowed him for a couple of months. Bauer went to Kansas City Community College where he received his mortuary science degree in December 2016. He did half of his internship in O’Neill and half in Norfolk. 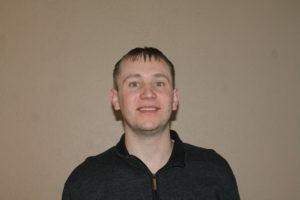 Last June Bauer received his Nebraska license and he recently passed the South Dakota state boards. As a funeral director, Bauer likes helping families through a difficult time. “It gives me pleasure to help a family,” he said.